If you are a member of Sailing Club at UWM, see you there. Cruise boat Meander leaves the dock promptly at 6pm. Moonrise at 6:33pm. Eclipse begins at 7:11pm. 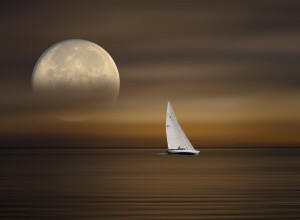 Amazing things happen on a sail boat. Directions: From Lincoln Memorial Parkway take Lagoon Drive east past the Kite Shop. Go left through the parking lot at Milwaukee Community Sailing Center. Walk through metal gate past MCSC building going north till you get to the lake. Turn right and see the garden and dockbox. Sign in and get PFD. Bring a hat and jacket for cool night air. Picnic earlier by the dockbox if you like. No alcohol. We’ll stay out as long as people are comfortable.